Pinky Pal - Dave Turner, GemPort Jewellery - I'm your PA : The virtual assistant company that likes to make you smile. 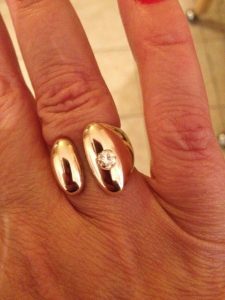 I first met Dave nearly four years ago, I loved the quality of the bespoke jewellery manufactured by GemPort and noted the prices were very reasonable too, however the jewellery that they have made for me has quite a twist! Now I know we are in the month of love, but the fact of the matter is having been divorced, I found myself with a whole load of jewellery that I would never wear again. Let’s face it, many people find themselves with jewellery either handed down, or “left over” after a break up, the scrap value of these items is often far less than we anticipate – that’s where Dave and Joanne at GemPort come in! I gave them all my old gold, engagement ring, wedding ring, old earrings, all things that I would never wear again. GemPort came up with a design based on a ring I really liked, melted down my “scrap” gold and turned it into a stunning ring which I wear pretty much all the time! Over the years Jo and Dave have refashioned gold and silver jewellery for me, all items that have sat in the bottom of a jewellery box gathering dust for years, now all have a new lease of life, are unique and worn with pride! Another little project I handed over to the GemPort team was a tiny 22 carat gold baby bangle. The bangle was one of the few precious items that my father bought me, however it was so tiny and frail, it just sat unused in a jewellery box. 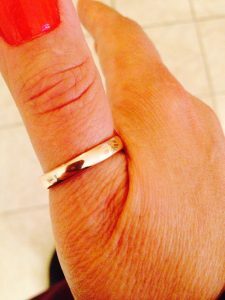 After a discussion with Dave and Jo I was delighted to find out it could be melted down and recast into a beautiful thumb ring, again another item of jewellery I always wear.